BRANSON, Mo. 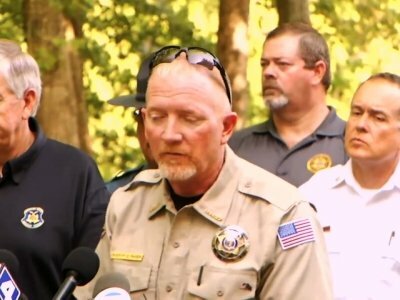 (AP) — A Missouri town known for its country shows and entertainment mourned Friday after 17 people — including nine from one family — were killed when a tourist boat sank on churning water in a sudden storm. The grief-stricken community hosted two separate vigils Friday night. In one, about 300 people gathered in the parking lot of Ride the Ducks of Branson and sang “Amazing Grace.” Mourners at a church sang the same words. Divers found the final four bodies Friday in Table Rock Lake near Branson after the deadliest accident of its kind in nearly two decades. State and federal investigators were trying to determine what went sent the vessel known as a duck boat to its demise. An initial assessment blamed thunderstorms and winds that approached hurricane strength, but it wasn’t clear why the amphibious vehicle even ventured out into the water. Officials haven’t released names of the victims, but the sad details emerged throughout the day. Among them: A popular duck boat driver, a father and son visiting from Arkansas, and nine relatives from Indiana, many of them children, who were on the ill-fated boat only because of a mix-up. Twenty-nine passengers and two crew members were aboard for a pleasure cruise. Seven of the 14 survivors were hurt when the vessel went down. At least two children and two adults were still hospitalized Friday afternoon. The captain survived, authorities said. Among the injured was 14-year-old Loren Smith of Osceola, Arkansas. Her father, 53-year-old retired math teacher Steve, Smith, and her 15-year-old brother, Lance, died in the accident. Loren suffered a concussion but survived. Tracy Beck, of Kansas City, Missouri, said she recalled the family members waiting in line and blamed a possible ticket mix-up for them ending up on the ill-fated boat. She said the ticket taker realized after they stopped for a photo that they should have boarded at a different location and assigned them new tickets. The sheriff said Thursday that two duck boats were on the water at the time of the storm. Both were headed back to land. One returned safely. The other did not. Divers quickly located the sunken vessel, which came to rest on its wheels on the lakebed. Authorities planned to recover it at some point in the next few days. For the latest updates on this story: https://bit.ly/2NwoQVz .